A bright and beautiful salad in varying shades of blue. 1. In a large bowl, toss the red cabbage with a few large pinches of salt, then set aside to soften slightly – about 15 minutes. Meanwhile, roughly crush the blackberries with a fork in a small bowl, stirring through the vinegar and 11⁄2 tbsp rapeseed oil; season and set aside. Pick out the viola flowers from the salad bag and set aside. 2. 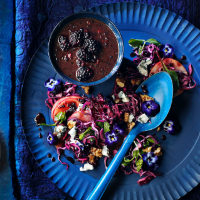 Whisk the mustard with the remaining 1⁄2 tbsp oil, then toss through the red cabbage with a handful of the salad leaves. Mix through 1⁄2 the apple, walnuts and blue cheese; season. 3. Spread the salad over a large platter, or divide among plates, scattering over the rest of the apple, walnuts and gorgonzola. Drizzle with the blackberry-balsamic dressing and top with the reserved viola flowers before serving.